Act! is the #1 best-selling Contact & Customer Manager. Trusted by individuals, small businesses and sales teams alike, Act! will get you organised, take the guesswork out of marketing and help drive sales so you can grow your business. An intuitive and easy-to-use application, ACT! helps build profitable relationships with contacts and customers and includes tools to manage and forecast sales. Act! Pro is designed for individuals and teams of up to 10 people. Manage anything and everything related to your contacts and calendar. 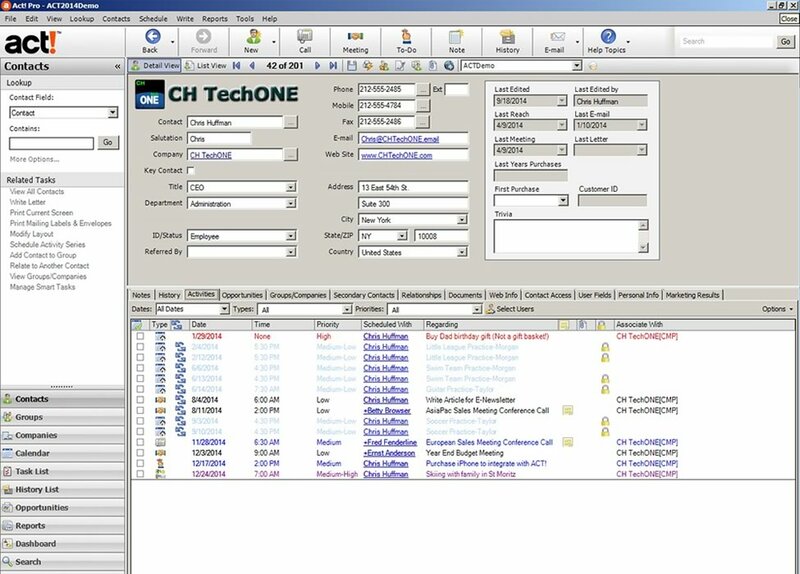 Create a holistic view of all relationship interactions at a company automatically, and benefit from an insightful look back at a consolidated history for your system and everyone you do business with. Take the guesswork out of knowing where to prioritize your time based on data-driven customer intelligence that serves up relevant relationship details for list groupings to quickly perform actions en masse to free up your time. 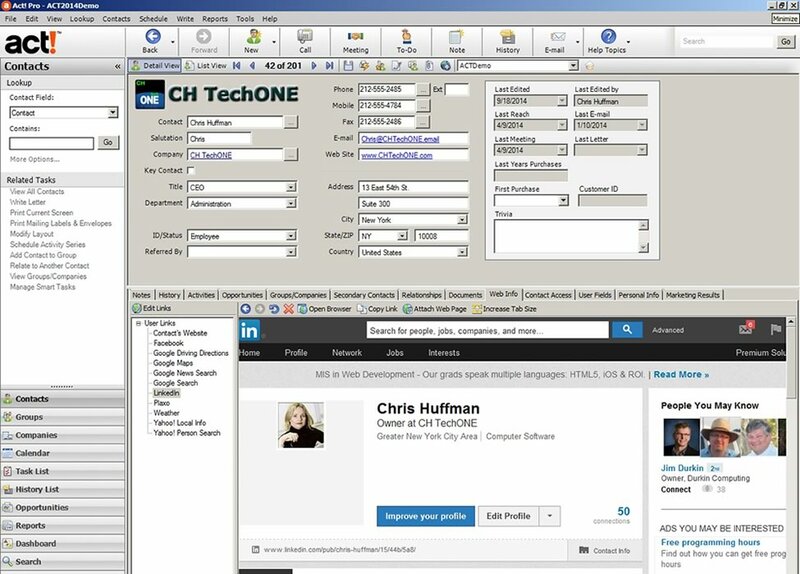 Seamlessly interact with the business and social tools you rely on every day, like Office, Outlook, Google and LinkedIn. Leverage integrated emarketing services to take the guesswork out of when, where, and how to engage with prospects and customers. Act! 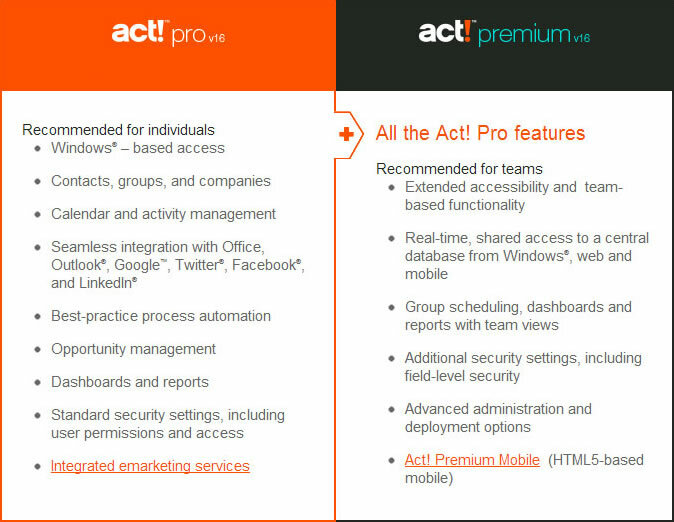 Premium provides you with all the features of Act! Pro and a whole host of other features. Act! Premium is designed for workgroups and teams of over 10 people who need additional scale, security and collaboration through centrally administered databases. With all the same features and value of Act! Pro, this offering drives productivity in the field with new mobile and hosting enhancements. Premium is designed for added peace of mind knowing your system and data are healthy via proactive system notifications. If you have fewer than 10 users, and do not require web access to the database or increased security, we recommend Act! Pro. Boost productivity with team access to a central database from Windows and the web. Stay connected to your business from your iPhone, iPad or Android device with Act! Premium Mobile — included with your purchase! ACT! the Number 1# Software for Business.